We all know the story of the old woodcarver Geppetto, who carved a marionette that came to life. Pinocchio might have been disobedient, and have broken his father's heart, but who couldn't help caring for the little puppet who, more than anything, just wanted to be a real boy? 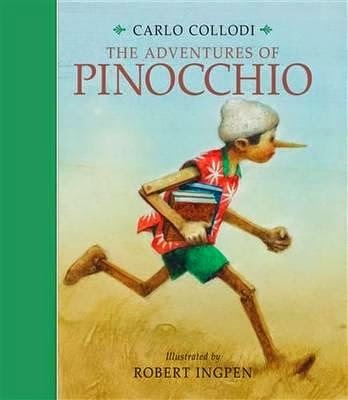 First written more than 130 years ago, The Adventures of Pinocchio originally appeared in series form in an Italian children's newspaper. Since then it has been printed in over a hundred different languages and adapted for theatre, film and television. This gorgeous hardcover edition forms part of the Walker Books Children's Classics series, all illustrated by Robert Ingpen, the only Australian illustrator to be awarded the Hans Christian Andersen Medal. It's a pairing of one of the world's great illustrators with one of the world's great stories — and the result is special indeed. The story is reproduced in its unabridged, original form (and hence contains several plot twists that will be unfamiliar to those only acquainted with the Disney film!). Each of the thirty-six chapters begins with a double-page illustration, with further illustrations appearing throughout the chapters. This is a simply beautiful production that made me want to rush out and buy the other eleven titles in the Children's Classics series: The Jungle Book, Treasure Island, A Christmas Carol, Alice's Adventures in Wonderland, The Wonderful Wizard of Oz, The Adventures of Tom Sawyer, Around the World in 80 Days, Just So Stories, Peter Pan and Wendy, The Wind in the Willows, and The Owl and the Pussycat and Other Nonsense Rhymes.